The Honda CRF250L has been revised with styling cues taken directly from Honda’s CRF250R and CRF450R MX machines, the new CRF250L is ready for anything a rider can throw at it: it’s tough, practical and equally at home around a city block or out on the trail. Well proven, the CRF250LAs tough steel frame and long travel Showa suspension remain unchanged, but new bodywork draws its influence from the minimalism for the CRF450R MX for a sharper, slimmed-down look. A digital dash adds a tachometer and fuel gauge and ABS is fitted as standard, with the option of disengaging it for the rear brake. The Honda CRF250L 2017’s frame is constructed from steel, with twin oval-section main spars and a semi-double cradle. A wheelbase of 1,445mm is matched to a 27.6°’ rake with 113mm trail and ground clearance of 255mm. Seat height is 875mm with wet weight of 146kg. Up front, a 256mm floating wave-style disc is worked by a two-piston caliper. Two channel ABS is fitted as standard and gives the rider the option to switch it off for the rear caliper. Aluminum rims (21-inch front/18 rear) wear block pattern tyres (front: 3.00-21 51P, rear: 120/80-18M/C 62P). A small detail – but a useful one off-road – is that the gear lever now features a folding tip. The CRF250LAs 249cc liquid-cooled single-cylinder DOHC engine has more bottom-end torque and high rpm power, with a linear delivery. Peak power of 18.2kW is delivered @ 8,500rpm with peak torque of 22.6Nm arriving @ 6,750rpm. Revised PGM-FI feeds fuel/air mixture through a 38mm throttle body (up from 36mm) and draws air from the airbox via a direct connecting tube. The exhaust muffler has a diameter of 115mm, houses the catalyser and uses two chambers: it’s 450g lighter than the previous design and a larger bore downpipe helps the engine breathe and make more power. Looking to get your bike licence but not sure where to start? We have published a handy guide packed with info and a step-by-step explanation of what is involved in getting your bike licence. Simply head to the link below, enter your email address and you will receive our 14 page guide instantly! 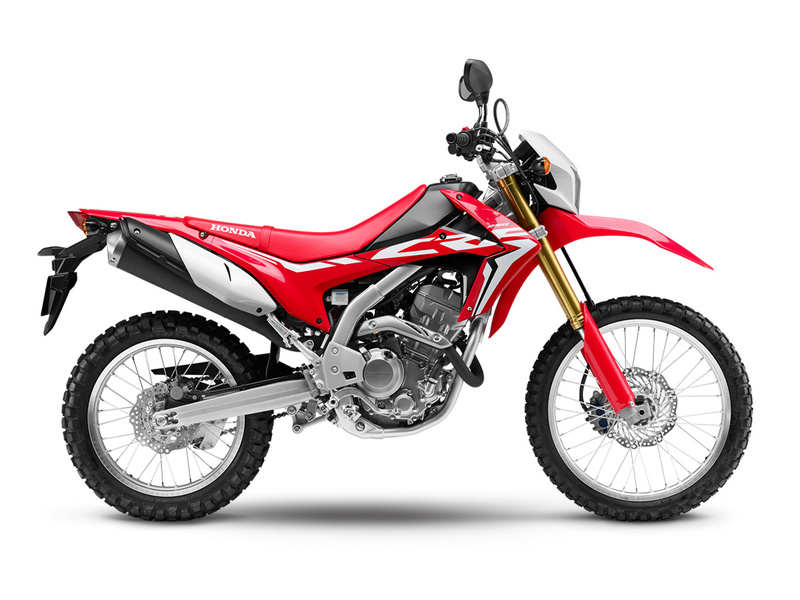 Check out the Honda CRF250L Trail Bike. Fuel injected liquid cooled with upside down front suspension and great looks. Available in an ABS version also. Extended Warranty comes into effect directly after the motorbikes standard warranty. Covered Items: Engine, Transmission, Electrical, Cooling System, Suspension, Brakes. Covered Items: Engine, Transmission, Electrical, Cooling System, Suspension, Brakes, Engine Management System. Covered Items: Engine, Transmission, Electrical, Cooling System, Suspension, Brakes, Engine Management System, Instrumentation and Electrical Systems, Steering, Fuel Systems. Honda Rider Assist is an available option which is a breakdown service only. The Standard and Extended Warranty also covers this kind of service as part of the warranty package through Swann Insurance. Read the Honda Rider Assist Benefits and Conditions / Limitations and Exclusions Here. To Add and Continue - Press "Close" below. Would You Like an Insurance Quote? SKU: . Categories: Bikes From $40 Per Week, End of Financial Year Sale - Ag, Ride Red Sale, New Bike Specials, Trail, Learner LAMS. Tags: abs, crf250L, Honda, lams, learner, motorbike, Motorcycle, Trail.